The NCB’s Plan 2000 for coal, dreamed up in the 1980s, where one of the ideas was the possibility of petrol from coal which would replace sales of coal lost to other sources, never materialised. In the late 1920s the same idea was tried at Welbeck colliery and sold as ‘Welbeck English Spirit’ by New Hucknall Colliery Co.
HM Chief Inspector of Mines Brian Langdon CBE retired on 19th January 2000 and was succeeded by Dan Mitchell (51). 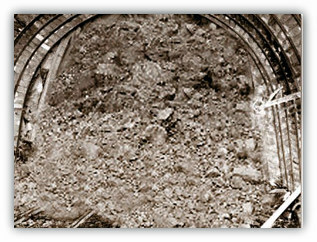 Calverton headgear was demolished by controlled explosion on 20th January 2000. 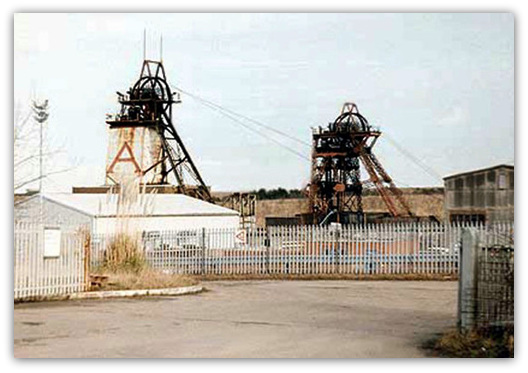 Collieries closed in 2000: Annesley Bentinck mine (Nottinghamshire), was closed again on 28th January 2000, this time by Midland Mining. It had been reopened in April 1995 by Coal Investments following the closure of the mine in February 1994 by British Coal. The mine was subsequently taken over by Midland Mining in June 1996 following the demise of Coal Investments. The 300 men employed would find difficulty in obtaining work outside the industry. Annesley was sunk 1865-1867 to the Top Hard horizon at 498.7 yards (456m) at No1 DC and 483.4 yards (442m) at No2 UC, and deepened to Deep Soft in 1914 at 624.5 yards (571m) and 615.7 yards (563m) respectively. Shaft positions SK55SW, No1 shaft 451773,353287, No2 shaft 451724, 353278, 465’ 10” (142m) above sea level. 120m of water-bearing strata was sealed by cast iron tubbing. In the 1980s a large red letter ‘A’ was painted on the white painted UC shaft casing of the rustic headstocks and the pit was referred to as the Big A.
Bentinck Colliery sunk 1895-1896, Shaft positions: SK45SE, No1 shaft 448740, 354963, No2 shaft 448769, 354969, No3 448799, 354974, 380’ 6” (116m) above sea level, and the two pits were connected underground and merged in 1988. It was Britain’s oldest working mine lasting 135 years. The Annesley shafts were deepened to 645 yards (590m) and 638 yards (583m) and vary from the original 13ft (3.96m) diameter to 17ft (5.18m). Roof bolting introduced on K90s face head using a Pegasus machine. Bentinck site included surface drift, position SK45SE, 448990, 355065, the 3 shafts having been dispensed with previously. No1 shaft filled and capped December 1988, No2 shaft filled and capped December 1992 and No3 shaft filled and capped August 1990. 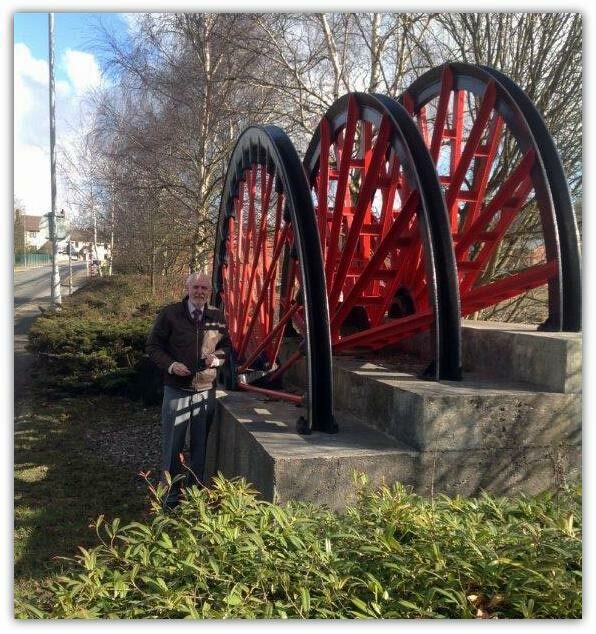 One of the winding wheels from Annesley at 19’ 6” (5.94m) dia was sent to the Apedale Heritage Centre near Stoke-on-Trent and a 26’ 0” (7.92m) dia wheel to the UDM HQ at Berry Hill, Mansfield where it stands as a reminder of the great industry that was. 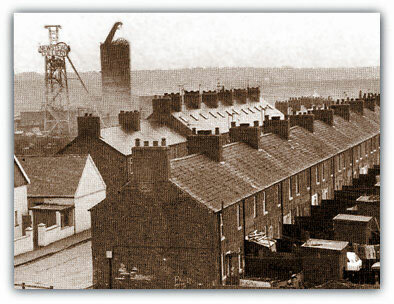 The mining village is shown and notice how close it was to the neighbouring Newstead mine shown in the background. Seam worked: Blackshale (3 leaf) finished 29/1/2000. However the water problem did not, and could not go away and pumping continued with an average of 1,615 gallons per minute from Bentinck K66s water lodge and up Annesley No1 and No2 shafts and along the long pipeline to the Tinkers Leen discharge point at Bobber’s Mill, Nottingham. On 4th February 2000 RJB Mining requested the Government to advance £60m to the company to save the industry, as the global price of coal had fallen to the lowest price for 25 years and RJB could not compete. The Government however felt that the ‘bail out’ price would be nearer £100m. RJB was producing coal but having difficulty selling it and finding new orders. The money would be necessary to develop new areas for the future. RJB Mining announced that during the last financial year the company had lost £130m, mainly due to the cheap price of coal, on the World market. Ray Hilton Midlands NACODS General Secretary died on 2nd March 2000, only two months after retirement from the pit deputies union, a post he had held for 19 years, previously working at Rufford and residing at Rainworth. Roland Soar had been appointed General Secretary in his stead. Henry Richardson (ex Creswell) NUM General Secretary for Nottinghamshire had retired earlier and was replaced by Keith Stanley (ex Newstead). On Sunday 12th March 2000 at 7.10pm there was a fire at the Sherwood Welfare on Birding Street, Mansfield Woodhouse. Fortunately the damage done was slight. A contract worker for Thyssens a mining engineering firm from Leeds, Yorkshire was trapped underground at Welbeck for more than an hour on 16th March 2000. Steven Walker (43) of Rossington was part of a team driving a new access road in the Deep Soft seam some 656 yards (600m) deep and 3280 yards (3,000m) from the pit bottom when the roof collapsed on the junction burying him in stone and rubble. Members of the Rescue Service rushed to the scene to give first aid and a Nottinghamshire Ambulance Service paramedic went underground to assess the situation. The accident happened at about 5.15pm and he was released at about 7pm and brought to the surface by 8.30pm and taken straightaway to Kings Mill Hospital for treatment. He had spinal and shoulder injuries. Helen Liddell MP (Lab) Energy Minister officially opened the £5m Shirebrook Green Energy Park on 6th April 2000. Methane gas pumped from old abandoned mine workings via pipes in the surface drift then burnt in engines to produce electricity to be used in the local supply system. The scheme was developed by Coalgas UK and Independent Energy based at Mansfield. Alcane Energy (previously called Coalgas) a Nottinghamshire company, turns colliery methane into energy. The firm was founded in 1994 and had sites at the closed Markham and Steetley colliery sites also. Stephen Byers (Lab), the Trade And Industry Secretary announced on 17th April 2000 that the Government had finally decided to give the mining industry a £100m life-line package to allow the present 17 mines to continue, including Clipstone which was due to close in September. However in August it was thought that this was illegal by the European Parliament. This decision would be overruled and a sum of around £60m would be allocated to RJBMining. The Coalfield Communities Campaign was urging former miners to write to their local MPs regarding how the Treasury had taken money around £1m from the surpluses of the Mineworkers Pension Fund. The average weekly pay for 80,000 retired Nottinghamshire miners in the pension scheme was £38, whilst some were scraping through on as little as £10. Steve P Wing was appointed Principal Inspector of Mines. Bob Leeming and A Forster were Inspectors. 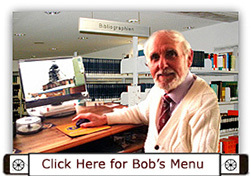 The Doncaster office was closed by March 2001. Thoresby (Nottinghamshire) successfully connected roadways through to the closed Ollerton north side workings in May 2000 that would hopefully yield some 7m tonnes of Parkgate reserves in the coming years, planned to start in 2003. As Surveyor at Ollerton from 1971-1986 I was particularly pleased to be informed that a check on a base in the old workings was to 3 seconds of arc and a distance closure of less than a metre and that all survey measurements, calculations and details checked at Ollerton whilst I was Surveyor were correct! An American firm Renco Group was interested in purchasing RJB Minings 13 Collieries out of the 17 deep mine Collieries in the country. Speculation increased when the share price of RJB Mining rose in June 2000. In the second week in August RJB Mining announced that for the first time since privatisation on 1st January 1995 a recruitment drive was in hand to set on 160 ex-miners and 100 Apprentices. During October the proposed takeover deal fell through and RJB Mining shares fell back again. 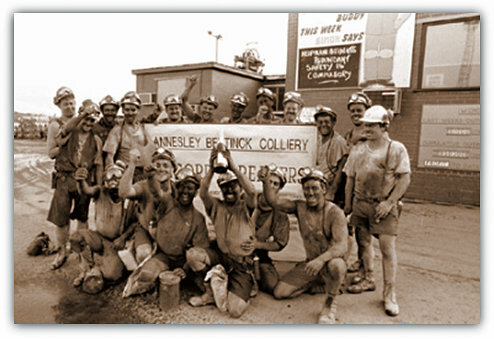 Administrators began winding-up proceedings against Annesley Bentinck colliery owned by Midland Mining Ltd.
Ex-miners in the Mineworkers Pension Scheme received 9% increase from July 2000, plus a bonus from the Pension Fund surplus of which the Government takes half. Silverhill colliery site was to receive £60,000 grant from the European Regional Development Fund RECHAR programme to reclaim and restore the old pit site and make it more accessible to wheelchair users. A total of £550,000 has been allotted to Silverhill and for similar sites at Bevercotes, Blidworth, Manton, Ollerton, Sherwood and Shirebrook. Hatfield colliery, Yorkshire, went into liquidation in August 2001 and after a period of care and maintenance was re-opened in November 2001 by RJ Budge (previously Chief Executive of RJB Mining) as the new operator. Clipstone (Nottinghamshire) had finished production in September 2000 as planned, and after the colliery was reprieved, work went ahead to develop a new 328 yards (300m) long face in the Yard seam to be ready for production in February 2001, so there was a break in coal production. A scheme to develop the untapped reserves in the Blackshale seam some 10m below was being considered, albeit that the sulphur content of the seam was high. The scheme was later turned down. It was announced that the mine would finally close in the spring of 2003. At Thoresby (Nottinghamshire) for the first time in the pits history there was a break in coal production just before Christmas 2000. The only coaling face had finished early and a new unit was not ready to take over. Thoresby has been one of the most productive pits in the country and the best in the region for many years and has consistently made the most profit. Sherwood Energy Village on the site of the 91 acres old Ollerton colliery site (Nottinghamshire) had taken a year to prepare for the commencement of building. 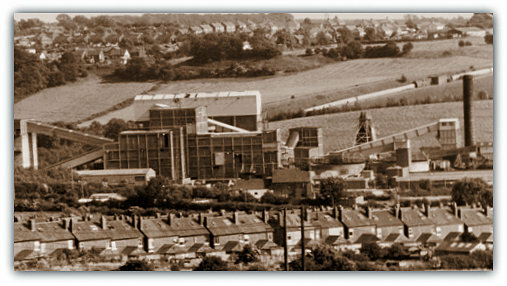 The colliery closed in 1994. The project, the only one of its kind in Europe was planned to create an environmentally sustainable development for 80 houses, industry and park land. It was hoped that the houses would be self-sufficient in energy, water and sewage needs. The Minister for Trade And Industry, Stephen Byers MP (Lab) had officially opened the start of the earthworks in February. It was hoped that up to 800 jobs could be created by encouraging industry and shops into the area where there was a surplus of young people needing jobs. Opencast: (RJB Mining): Nadins: plus Nadins Extension: Block, unnamed, Yard, Upper Cannel, Little, no name, Cannel, Main Rider, Over Main, Nether Main, Little Woodfield Rider, Little Woodfield Top leaf, Little Woodfield Bottom leaf. Numerous old shafts were exposed varying from 1.0m to 2.5m dia. Carrington Farm site(HJ Banks & Co) continued mining Piper, Hospital Upper leaf, Hospital Lower leaf, Deep Hard, Low Main and Threequarter.